This is just a reminder that there will be no Latin Mass in the extraordinary form in York this coming Sunday, December 30th. The regular weekly Mass at 4pm in English Martyrs' Church, Dalton Terrace, will resume on Sunday 6th January. The Latin Mass Society is organising a pilgrimage to Rome in November 2013. The departure date is Thursday 7th Nov and return will be on Tues 12th Nov. The flight will probably be from either Stanstead or Luton to suit the majority of pilgrims, although other possibilities are being investigated, including a northern option. 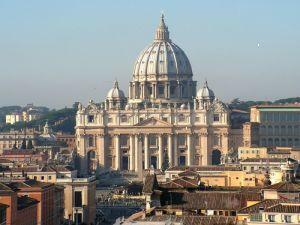 Accommodation will be in a convent in central Rome. The timing has been selected to coincide with biennial general meeting of the International Federation Una Voce. 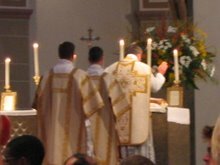 Consequently, there should be Latin Mass supporters from many parts of the world in Rome at the time. Although pilgrims will not be taking part in this meeting which takes place on the Saturday and Sunday, they will be able to attend a number of traditional Masses and liturgies associated with it. Some time will be set aside for sightseeing. The cost has not yet been established, because various travel options are still being explored. Every effort is being made to keep the costs down, so that the pilgrimage will be as affordable as we can make it. 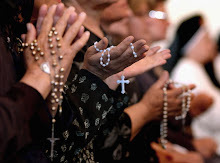 Thers a good article in this week's Economist about traditional Catholicism. You can find it on their website www.economist.com Go and add a comment. I received an e-mail today from Lucy Shaw who runs the Guild of St Clare. This is associated with the Latin Mass Society and is for people interested in using their needlework skills for the benefit of the traditional liturgies of the Catholic Church. It is mostly concerned with the making and repair of vestments. One of the first fruits of the guild was the banner that was carried at the pilgrimage in honour of St Margaret Clitherow at York earlier this year. Lucy has recently been contacted by a lady living in the West Riding who is interested in joining a local branch of the Guild of St Clare. At present, no such local branch exists, and Lucy was asking me if I could put her in touch with anyone who might be interested in starting a branch in the Yorkshire area. I don't think that the Guild of St Clare limits its membership to ladies, so anyone interested in this type of work can contact me on paul@gooleboathouse.co.uk and I will pass the information on. The Sunday Masses at the Church of St Alphonsus, North Ormesby in Middlesbrough have been discintinued for the time being. They will be restarted at another church, sometime after Christmas. Mgr Heslin will continue to be the celebrant, so it is likely that the new venue will be nearer to where he lives in Saltburn. The exact venue and timing of the Mass are not yet known, but will posted on this blog as soon as the details are made available.